We recently held a workshop to assist researchers in locating information about First World War soldiers. If you want to get started on your research we’ve put together these helpful resource suggestions highlighted in the seminar. 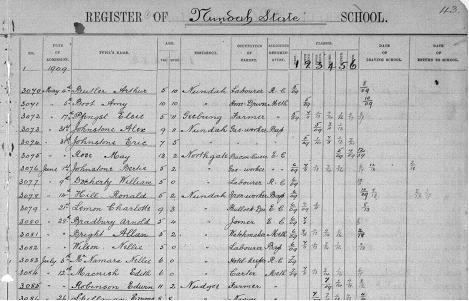 Here is an example of a school admission record for Edwin Robinson, who attended Nundah State School as a pupil, was a teacher there prior to the war and returned to teach at Nundah School after the war. During the workshop the Project Manager, Queensland Registry Births, Deaths & Marriages explained how registry records concerning service personnel who were killed were compiled, and what information is included in the registers. Mike Vitobello highlighted the fact that war deaths from the Great War are prefixed with an F and that thousands of these historical images have been added to the online registers over recent months. These death registrations are available to search, order and download and upcoming registry news is provided in their quarterly family history newsletter. The State Library of Queensland (SLQ) holds a wealth of First World War material including diaries, letters, photographs, oral histories, maps, magazines, books, posters, newspapers and cutting books. More information can be found by searching the One Search catalogue. Also, SLQ staff and guests post interesting and well-researched articles to the blog called Queensland’s World War 1 Centenary. This is not a comprehensive listing but it would be a good start for a soldier search. What do you find useful or helpful?